Today we had an early start and were on the road by 8am as we had quite a lot of riding to do today and through some beautiful mountain scenery and if was to be anything like yesterdays effort which left me feeling like the motorcycle paparazzi then it would be a very long day. 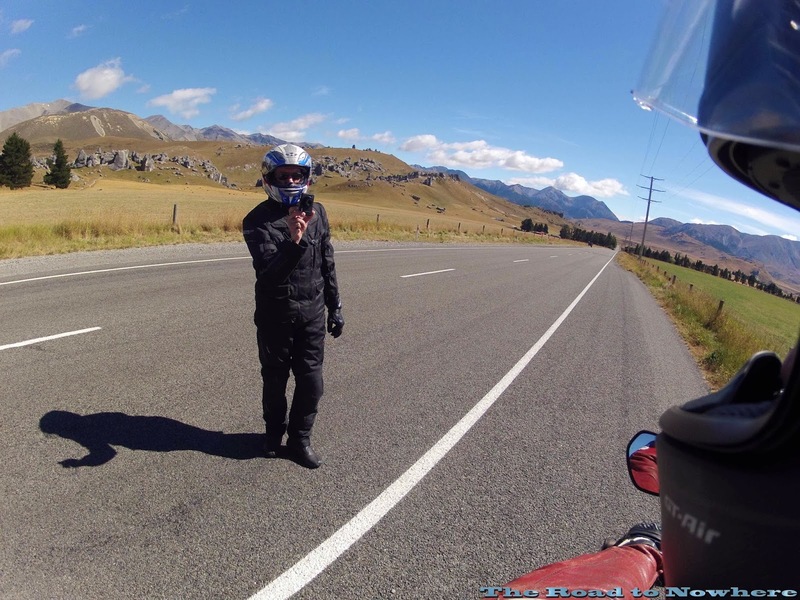 I got to sample the Triumph Explorer 1200 from Hanmer Springs to the next fuel stop. It had a very torquey engine and I ended up riding it in 4th gear along the highway as it felt right, I really liked it along the big open sweepers it felt better than the beemer, not sure what it would be like in the tight twisties though. I didn't get the buffeting from the screen like on the bmw either. We cruised back down towards Christchurch but took the inland route through to Rangiora. We actually didn't make it in there which was a designated fuel stop because the bridge was blocked to all traffic for some reason, probably an accident we couldn't quite see why. So we diverted around through Ashley Gorge which was the way I wanted to go anyway. It was a beaut ride through the country side but everyone was getting worried about their fuel. Doubters! We stopped in Oxford for fuel for both the bikes and us before we made the ascent up the legendary Arthur's Pass. I must say that it did not disappoint, I loved the mountain scenery along here with big sweepers running through the valleys between the huge mountain ranges. They are unlike anything we have in Australia. It was just after the two photos above that my brother lost his gopro off of his bike. He too mounted it to the surface of the side pannier like Geoffro back in day 2's video, although I didn't know at the time as I pulled over to take photo's of my own I saw Wayne pull in and asked where Dave was and he just said that Dave had turned back which we assumed he was just taking more photos but he went looking unsuccessfully for his gopro. I couldn't believe what I was seeing along this stretch of road. You'd come around one bend to this huge mountainous scenery where you would stop and take some photo's. I'd then remount the bike and ride two bends later and say" Oh wow" and have to pull over again to take another couple of photos. It will take us 2 or 3 days to get to Fox Glacier at this rate. But boy was it fantastic scenery. We arrived at the top of Arthur's pass which there's not a lot there just a little village and then some twisty roads coming back down. Then we came to the via duct which is an amazing piece of engineering in the mountain pass. As we pulled into the car park at the look out we noticed some Kea's sitting on some tourists car. We had been warned about the Kea's eating bike seats and grips etc When Dave left his bike to take some photo's they pounced on his bike one attacking the front tyre. Another flew up on the top box to see if he could get at his gloves. Geoff vowed to run one over by the time we left NZ but sadly for him, but happily for the Kea he didn't manage to do it. The road down from the via duct was probably one of the worst surfaces we had ridden on in NZ so far, it just reminded me of riding on NSW roads back home but they were probably still better than our roads. The surface had broken up probably due to the harsh winter. It's hard to think that this road is a major Highway. Roads like this back home are relegated to being back roads. The weather started to turn a bit overcast again as we approached the west coast and Hokitika where we stopped for some fuel and a bite to eat. We continued on down towards Franz Joseph and Fox Glacier. The further south we went the weather got worse covering the mountains with cloud and spitting with rain again. 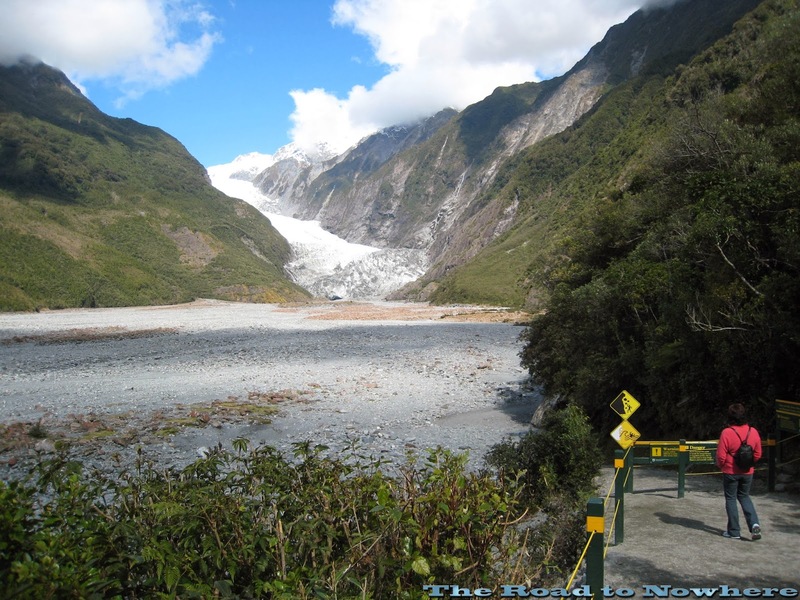 Even though the weather had turned bad again with low cloud cover I still wanted to go up and have a look at Franz Joseph glacier to see if I could get a photo to compare when I was here in 2007. The other guys continued on into Fox as I turned off. It was a bit unfortunate that I didn't get a good view of the glacier today, but you can just make out that it has retreated quite a lot from looking at my 2 pics below. I can barely see any glacier in the 2014 pic. After the disappointment of not seeing much at the glacier I was just about spent for the day and just wanted to get there and get out of my riding gear. We'd done about 500km already and it was only a short 24km ride from Franz to Fox and it's a cracking bit of road. Here's a very short video of the fun to be had between the glaciers. Here is the map of the route for day 4's riding. Yep. That was a good days riding for sure. What do those white and yellow double lines on the road mean? It sure was bro, the roads the scenery all made for a great ride. Eh I've no idea what the lines are for, don't forget we were in a different country so who knows what that shits for?? More of my favourite bits of the South! Yep some of my favourite bits of the south to. You guys are spoilt rotten, i have to say that, Just about every bike rider we saw waved at us to. How friendly is this place? Beautiful pictures. A good day when the scenery is so nice you want to stop all the time. Bike/car destroying birds. How odd. I'd never heard of them before. Here the birds just swoop in and eat the squashed bugs off the front of your bikes/cars. I bet you were glad for the suspension on the BWM heading down from the duct. Thanks Brandy, with the amount of picture I actually took I it made it easy to find some good ones. Its hard to take a bad photo with scenery like that. Yes those pesky little parrots will tear up your car or bike and just about anything else left laying around. I was enjoying the suspension the whole trip except in the twisites as i really couldn't cope there really well. Wow .. just wow. That scenery is to die for!! I've never seen a glacier, I want to see one now. Love the Kea, gotta love any birds with attitude. It was handy being able to park in the bar tho .. very nice of them. For a country kid from Forbes, I'd never seen mountains or glaciers so to me it was some of the most amazing natural beauty i'd ever seen. I didn't like those pesky little birds, especially if it was going to cost us money in excess fees, so it was great we could park inside the pub. Yes the cameras came in for a bit of a beating on this trip, but mine managed the whole trip without a hiccup.